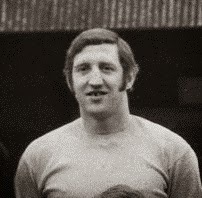 According to Harry Redknapp in his autobiography Billy Meadows had “more front than Sainsburys”, he damn near scored a goal in every other game in some 192 competitive appearances at Underhill whilst competing for goalscoring chances in the same team as the likes of Les Eason and Roger Figg and then player-managed Barnet to promotion back into the Southern Premier League in 1978. That makes him a legend surely? Bill was born in Bushey in 1942 during the height of the 2nd World War the youngest of seven footballing mad brothers and sisters – elder brothers Tony signed with Tottenham and John played with some distinction at Watford - but grew up in Islington supporting The Arsenal. “Fulham's Johnny Haynes was my favourite player though” says Bill. “The great Ron Greenwood was assistant Manager at Arsenal, a friend of the family and he also coached Harrow Schools. I must have impressed him at County and District level because at 15 I signed for Arsenal. Tommy Docherty was at the club at the time, it was incredible. I stayed some 5 years trying hard to make the grade at left half. Things didn’t work out, probably because of my youthful arrogance and I became slightly disillusioned with football and took a break for a couple of years”. 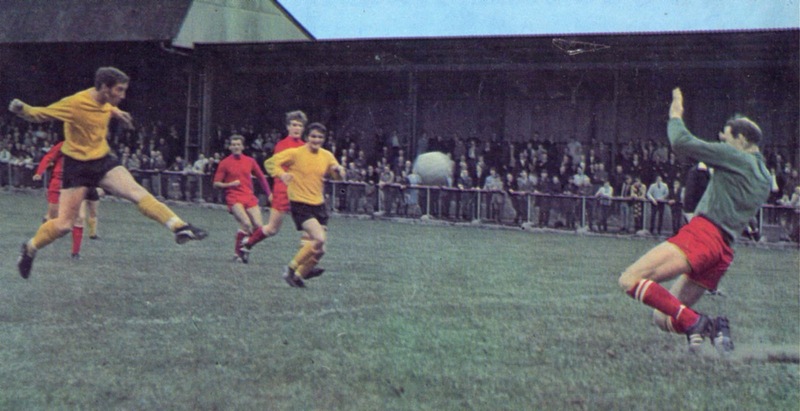 Dave Underwood, later to become Chairman at Underhill, was another old friend of the family and he persuaded Bill to pick up his footballing career at centre forward in the team he was building at Hastings United. “I learnt to jump, as I am only 5’10” and put my head where it hurt. I lost teeth and broke my nose three times but I scored goals” he said. “There was no sophisticated physios then just a sponge and a queue at Casualty or wait until Monday to see the Doc!“ he chuckled. “Dexter was the finest manager I ever played under although it was only for a short time and he knew how every one of his players ticked, he was an incredible man. Bill made his debut as a substitute on 17th August 1968 in a 1-2 defeat at Poole Town in the following line up in the old 2-3-5 formation. Bill scored our goal of course! I told Bill that Les had said that he was his perfect partner and Bill returned the compliment. “Yes Eason was the best. Could turn on a sixpence and was so sharp with a great brain, I was just the idiot who put his head in where it hurts” he chuckled. “A great memory is when we beat Burton Albion 10-0 and Les and I got 4 each. When people asked me how do you score so many goals, out came that old arrogance again – ‘I shoot at every opportunity and hardly ever miss. My nickname at Hastings was Billy the Shoot because that is what I did, that’s how you score goals it is not rocket science is it? Besides I didn’t have the pace of a Paddy Powell go past people did I?” he laughed. “Arthur Bush at Hereford phoned me and said ‘Meadows on the list eh? How much do you want to come to Hereford?’ I thought about it for a few seconds and then the old Meadows front came out again and I went for the jugular – two grand signing fee and 30 quid a week! I got travelling expenses too!” Bill winked. “Ricky George joined me just after Barnet had beaten Newport County in the FA Cup and Tommy always suspected me of coaxing him to Edgar Street to share the 4 hour drive but that wasn’t true”. Bill then told me all about the great Hereford Utd games against Newcastle and West Ham – he has all his press cuttings too. Harry Redknapp tells the story of Bill’s “despicable and outrageous” verbal wind up of Bobby Moore during the games. “Meadows had more front than Sainsburys but Mooro took it all in his stride and never lost his cool”. “We lost 3-1 at Upton Park in front of 42,000 with 1,000’s locked out. Geoff Hurst scored 3 breakaways and I scored at the end” said Bill. With the help of Dave Underwood we attracted a whole host of experienced pro’s to the club and some fine young talent. “I signed Marvin Hinton on the West Bank before he saw the dreadful facilities in the main Stand, I also signed John Fairbrother, Walter Lees and Terry Price in the same manner” laughed Bill. “Dave was responsible for getting Jimmy Greaves which really was something special and my old partner in crime Eason was back too. However my favourite signing at the time was big Dennis Brown, what an engine the guy had. One minute he would be clearing the ball off the line, next he’d be taking a throw then crashing the ball into the net!” We won the Southern League Div 1 South playing some fantastic football. Bill’s departure form the club in 1978 was sad - “I was sacked, simple as that but things like that happened, no hard feelings” he reflects. “I took a long break and enjoyed the family again” He hadn’t hung his boots up for good as he more often than not was found coaching local school children or travelling all over the country to appear in Dennis Waterman’s X1 Celebrity matches doing his bit for Charity. Living in Berkhampstead he is nowadays full of beans, slim and healthy “apart from these dodgy knees!” He is a ‘fully licensed’ cab driver who loves his Speedway at Rye House and never stops telling stories, he is infectious! The stories will go on forever and you will always be royally entertained in his company. Billy Meadows is a hero of mine, and now proudly a close friend too and does still ‘have more front than Sainsburys’.